How Mobile Application Development can Grow your Business ? It used to be that for a business owner to reach to prospective customers or clients from all over the world, the internet is the go-to avenue in order to become virtually visible and recognizable. But now the times have changed—a lot. For a business to become accessible at the fingertips of any consumer by a smartphone or a tablet at all times, it should have its corresponding mobile application. Let’s face it. Before a consumer would buy a product or service, he researches about it online. Simply put, mobile application development is software development that will run on mobile platform such as a smartphone, tablet or phablet. These mobile apps run on operating softwares (OS) like iOS, android or windows to name a few. With the variety and availability of mobile devices, mobile application development has now become an integral part of any business owner to leverage their business. With the help of your mobile application, your business can become instantly and constantly visible anytime and anyplace for a consumer who is always on the go and is ready to purchase from your business. A mobile application can also create a direct marketing channel with the a notification button that could inform your customers about your latest offerings. This adds to the convenience of your customers with great purchasing powers. As your way of creating interaction with your customers, you can also integrate social features such as likes, messaging or comments in order to get immediate feedback from your customers. Your business mobile application can be a form of advertising to create easily recognizable branding for your business. The more your customers frequently see your mobile app in their mobile device, the more familiar your business would become. development has become a large market in the technology industry at present.This demand has led to the influx of mobile application developers that provide you the best solutions to the mobile application needs of your business. As a matter of fact, our team at GetYOteam takes part of providing solutions to this technological demand in the business world. We have designed and created iOS/Android mobile applications to small business to large corporations across the world such as Wago,Hafslund,Atago, USA Inc., Music Blues, Audi Delhi West, Hubble and Eagle Eye to name a few. 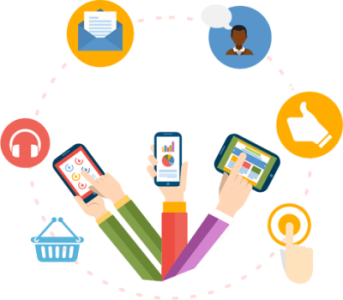 We help all kinds of businesses who want to leverage their products and services through a user-friendly mobile application. We’re here to give your business a high level of online visibility and accessibility with all the right features that make your mobile application convenient to use by your customers. You can interview our principal and certified mobile application developers who can help you create the best team that suits your project requirement. We want to see you grow and become part of our awesome collaborations.